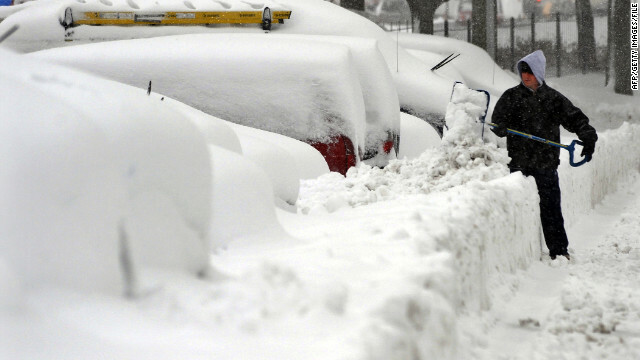 A man in Silver Spring, Maryland, shovels snow to dig out his car after a blizzard in 2010. Are you ready for Winter Storm Rocky? The Weather Channel wants viewers to be on a first-name basis with the foulest of winter weather. The cable channel announced Tuesday that it will give names to the worst winter storms much like the National Hurricane Center does for tropical storms. “Naming winter storms will raise awareness, which will lead to more pro-active efforts to plan ahead, resulting in less impact on the public overall,” Tom Niziol, the Weather Channel's winter weather expert, said on the channel's website. Niziol wrote that winter storms are commonly given names in Europe, but he said that the lack of a single authority over winter storms in the United States, like the hurricane center is the central authority on tropical storms, is one reason why the winter blasts are not named. That's where the Weather Channel thought it could step in, Niziol wrote. "We have the meteorological ability, support and technology to provide the same level of reporting for winter storms that we have done for years with tropical weather systems," he wrote. The Weather Channel said it hopes other meteorological agencies will buy into the naming plan. Naming winter storms will also make it easier to provide info about them in the age of social media, Niziol said. "On the occasion that different storms are affecting separate parts of the country, naming storms will allow for clearer communications," he said. So what names will we see for the winter of 2012-2013? Well, let's just say the Weather Channel is going Greek, at least partly. Athena tops the A-to-Z list with Zeus at the end. In between are Triton, Draco, Plato and Euclid. But the list does bring names into modern times. One winter storm could be named "Q" - that's it, just Q - after the New York subway line. Another could be named Rocky, after one of the mountains, not the movie. What name the storm gets will be determined by factors, including the day and time it hits as well as the ice, snow, wind and temperatures it produces, Niziol said. And the names should be better than the monikers informally bestowed upon winter weather now, such as "Snowmageddon" or "The President's Day Storm," Niziol said. i'm confused is it global warming or global cooling we're supposed to be afraid of this week? Terrible idea...most Winter storms are complete busts by the time they come through the east coast. We usually aren't accurately told how bad it's going to be either until the storm is on top of us. Knowing the storm's name beforehand isn't going to do anything...put your time and efforts into predicting the outcomes of these systems better, not tacking on names to them!!! Did you ever stop to think there is a whole lot of the US that isn't the East Coast? stop thinking only of how it affects yourself personally and think about the people it will help. Most of our winter storms go right over-head and rarely hit Colorado these days. For the past 3 years, Colorado has recieved less than 20% of our usual precipitation. It's so dry, rodents eat the bark off of thousands of Aspen, which kills it. (Aspen nourish themselves through the bark) We have thousands of acres of dead Aspen added to our thousands of acres of dead evergreens, slaughtered by bark beetles that survive our mild winters. WATER simply does not evaporate as fast as it used to. (shade of pollution) Precipitation that used to fall on dry land now takes longer to form clouds. By the time the clouds are filled with enough evaporated water to rain, they've already flown over Colorado. The same thing happens everywhere. Global climate change is all natural. Greedy and excessive polluting of earths atmosphere has only offered shade over water. this has taken what would have been a slow and gentle climate warming and turned it into one with unusual and oftentimes violent weather extremes. For a fact, if humans were to come to a complete halt polluting earth's atmosphere, our weather would begin reverting back to what we were used to. However, the earth's climate would continue to warm about 1/5th of one degree per year just as it is now. Yeah, because Antartica is such a warm paradise. This is just plain stupid. The weather channel is wrong more than any other weather station. Their "news" is old. They are OK for covering hurricane's but that's about it. Thunderstorms and Tornados come and go too fast for TWC to stay current. Same for snowfall. The can become a news aggregator, but not an actual source. I do not think naming winter storms is the best idea. I live in Maine and our stations here call it a storm if we get 3" if snow. We first need to clearly define what make a storm a "Storm". Just because it is snowing, doesn’t make it a storm. Also, what may be considered a storm to people in another state may not to us. In Maryland, they get 4" of snow and the impact is far greater then it is for us up here simply because we are more accustomed to it. So when storms are named and you are telling people to get prepared, not all of the same areas are going to have the same impact. It would also be important to report them more accurately. More often than not, they are blown out of proportion even before they form. Last year we were told a storm of the century was coming. We were told to prepare for up to 3 feet of snow. We got 6”. That was WAY out of the margin of error. Weathermen will do anything to make news! Plus, there is no accountability in weather forecasting. A storm does or doesn't develop, there's always an excuse. Wish I had a job like theirs! Big bucks and no accountability! it is all part of TWC's plan to convince us that global warming is way worse than it actually is, and that the weather is totally going to hell. used to be only actual hurricanes got names, then they started naming tropical storms, now they even name tropical depressions...all to make it look like there are lots more storms when in fact there is virtually no statistical change in hurricane frequency. if we're gonna name insignificant little gale-force squalls, why not name winter storms too? make people forget that global warming should mean FEWER major winter storms, not more.